In late September, Leymah Gbowee, executive director of the Women, Peace and Security program at Columbia University, shared her expertise with world leaders, dignitaries, entrepreneurs, and activists gathered in New York for the United Nations General Assembly and related events. Her reflections about sustainable development, peace and security, and social change emphasized the importance of partnerships with and among women, as well as the need for a broader, more holistic understanding of peace and security. These themes are at the heart of the Women, Peace and Security program’s approach to research, education, and public service. Gbowee went on to emphasize that peace and security are not just related to militarism and war; she identified homelessness, economic justice, the #MeToo movement, and Black Lives Matter also as issues of peace and security. As a United Nations Sustainable Development Goals Advocate, Gbowee addressed the 73rd United Nations General Assembly about the promise of the UN’s Sustainable Development Goals (SDGs) and the 2030 Agenda for Sustainable Development. Together with other SDG Advocates, she also participated in an annual meeting with the UN Secretary-General about the state of the SDGs. A central tenet of the 2030 Agenda is ensuring that no one is left behind in the fight against poverty, inequality, and climate change. 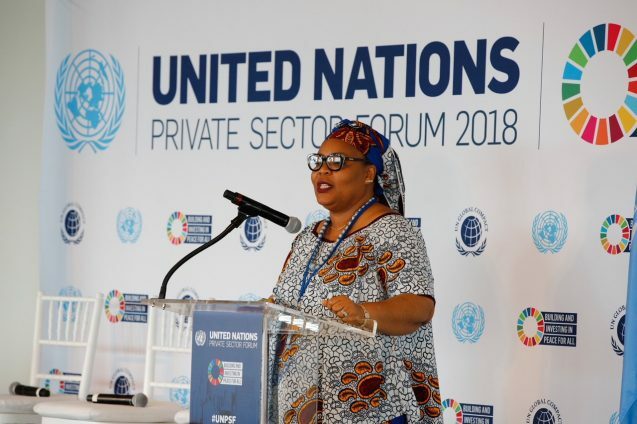 In an SDG Media Zone discussion called “Leaving No One Behind,” Gbowee highlighted the ways in which complex interconnected webs of social conditions can impede the successful implementation of the SDGs. When talking about quality education, for example, she mentioned that reproductive rights and poverty need to be considered. 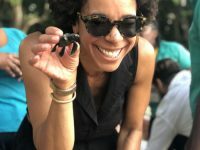 Since its launch in 2017, the Women, Peace and Security program at Columbia’s Earth Institute has been committed to advancing women’s partnerships for peace, amplifying the expertise of grassroots women activists, and broadening conceptualizations of peace and security to include vital themes of racial justice, reproductive rights, environmental sustainability, economic justice, and more. 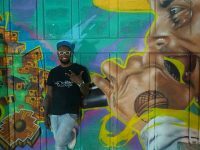 Most recently, to promote partnerships and knowledge exchange among women peacebuilders, the WPS program, in collaboration with the Columbia University Nairobi Global Center and the Graduate Center of the City University of New York, has made a call for applications for the first iteration of its Peace and Social Change Fellowship Program. More information can be found here.